What Support Does Taco John’s Offer? Initial Franchise Fee. The Initial Franchise Fee for your first Taco John’s Restaurant is $25,000. If you are an existing franchisee of ours and want to open a second or subsequent Taco John’s Restaurant, the Initial Franchise Fee is $20,000. If you have signed either of the Development Agreements, the Initial Franchise Fee for each Franchise Agreement you commit to develop and operate under the applicable Development Agreement is $20,000. The initial franchise fee is non-refundable in all circumstances once paid. Real Estate Purchase or Lease. You may either purchase or lease the land for your Restaurant. Land purchase costs generally range between $8 and $20 per square foot, but such costs may vary substantially based upon the location of the site, and are generally higher in urban/suburban areas than in rural areas. Ground lease costs generally range between $1.50 and $3.00 per square foot per year and, as with land purchase costs, the square footage costs for ground leases may vary substantially based upon the location of the site. You should consult a real estate agent or broker, or other person experienced in real estate costs for a better estimate of your real estate costs. Site Preparation and Completion Costs. The cost of site improvements (such as site demolition and preparation, grading, curbing, gutters, sidewalks, paving, utility extensions, site lighting, landscaping, exterior trash enclosure) will vary widely based on the condition of the site, its size, local code requirements, as well as local construction costs. The range of costs shown is for a 22,000 to 30,000 square foot site. There may be unusual costs associated with a site. Construction Costs. This estimate assumes that you will construct a free-standing wood-frame building of approximately 1,900 to 2,100 square feet, having a synthetic stucco exterior finish and commonly accepted quick service restaurant interior finishes, which may include wallpaper, painting, tile and/or wood paneling. The costs for the building will vary based upon local construction costs, local codes and standards, as well as factors such as the time of year the building is constructed, the availability of a skilled work force, construction financing and other variables. In addition, you will be required to obtain various permits and licenses associated with the development and construction of a new restaurant or for improvements to an existing restaurant. These amounts are reflected in this chart as Miscellaneous Opening Costs. In the event an existing free-standing facility is being converted to a Taco John’s Restaurant, construction costs are estimated to range between $200,000 and $500,000, but costs may vary substantially depending upon the prior use and condition of the facility. Operating Equipment. The estimate of your investment for operating equipment is based upon equipping a newly constructed free-standing facility with specified food preparation and storage, and equipment. These costs will increase if you purchase additional optional equipment for the Restaurant. Furniture, Fixtures and Decor. This estimate is based on a free-standing Restaurant with a range of 40 to 56 seats. Your costs may differ depending on the type of facility and the location and seating capacity of your Restaurant. Signage and Installation. Your investment in signage may be higher or lower depending on the size and height requirements mandated by local laws and regulations. Point of Sale System. You must purchase a Point of Sale System from an approved supplier. The Point of Sale System includes electronic cash registers, kitchen video monitors, receipt printers, a drive-thru speed of service timing system, and headset system. For each Franchise Agreement or TRA for a Signature T16 Taco John’s Restaurant signed during the Sales Incentive Period (defined in Item 5 above), provided you open the Restaurant on or before December 31, 2018, we will pay the approved supplier up to $20,000 toward the cost of the purchase of your Point of Sale System for the applicable Taco John’s Restaurant, payable within 10 days of presentment of evidence acceptable to us that you have purchased the required Point of Sale System. If you sign an ADA during the Sales Incentive Period, this incentive payment shall apply to all Franchise Agreements for a Signature T16 Taco John’s Restaurant signed under the ADA, regardless of when each Franchise Agreement is actually signed and the Restaurant opened, provided you are in full compliance with the ADA, including the Development Schedule, at the time you sign the applicable Franchise Agreement. If you are not in compliance with the ADA, we may terminate the ADA, or permit you to continue to operate under that agreement but without the Sales Incentive Program benefits being available to you. Initial Inventory. You must purchase all food products and supplies from distributors or suppliers that we approve, and which may include us or our affiliates. Grand Opening Marketing. You are required to spend an amount to be determined by you and us for grand opening local advertising and initial promotion of the Restaurant. Although not required under the Franchise Agreement, we anticipate that many Franchisees will spend more than the minimum amount required to promote the opening of their Restaurants. Pre-Opening Training (Travel and Living Expenses). This amount includes airfare, hotel, food and transportation expenses for three persons for four weeks of training in either a Nationally Certified Training Restaurant or a company-owned Restaurant, whichever we designate. Miscellaneous Opening Costs. This estimate includes the costs of permits and fees required by local governmental rules and regulations that will be associated with your project development, site preparation and building construction. It also reflects the costs for professional services you may require with architects, engineers, attorneys and/or accountants. Additional Funds. The disclosure laws require us to include this estimate of costs and expenses to operate your Taco John’s Restaurant during the “initial period” of the business, which is defined as three months or a longer period if “reasonable for the industry.” We are not aware of any established longer “reasonable period,” so our disclosures cover a three-month period. This estimate reflects the funds you should have available to cover operating costs during the initial period as a cash reserve for incidental costs not covered by cash flow during the start-up period and that are not included in any of the above categories. Such operating costs may vary substantially depending upon the size and location of the Restaurant and the number of persons you choose to employ. This item does not include the cost of any financing, interest, or the amount of debt service obligation that you may undertake. Total Estimated Initial Investment. This amount reflects our current estimate of your initial investment for a Taco John’s Signature T16 Restaurant. The amounts shown are our best estimates of the amounts that Franchisees may spend for the purposes indicated. However, your actual costs may be higher or lower depending upon your particular circumstances including the size and/or location of the Premises of the Restaurant and whether you lease or purchase the land and/or building for the Premises, construction and labor costs in the area, your discretionary expenditures, and other factors, such as tenant allowances negotiated with the landlord, if any. We relied on more than 48 years of experience operating Taco John’s Restaurants to compile information we have obtained from our current Franchisees. The estimates are averages and reflect expenses for a single Restaurant under typical circumstances. Your situation may not be typical, and unforeseen circumstances may arise. You should review these figures carefully with various business advisors before making a decision to purchase a Taco John’s Restaurant franchise. You should be aware that a variety of factors such as market demand, demographics, the extent to which you follow our methods and procedures, local economic conditions and your own business experience may affect many of the described expenses. We do not offer financing directly or indirectly for any part of the initial investment. Initial Franchise Fee. The Initial Franchise Fee for a non-traditional Taco John’s Restaurant is currently $10,000. The initial franchise fee is non-refundable in all circumstances once paid. Real Estate Lease. You will typically enter into a lease for your non-traditional Restaurant. Lease costs generally range between $15.00 and $35.00 per square foot per year but the square footage costs may vary substantially based upon the location of the site. You should consult a real estate agent or broker, or other person experienced in real estate costs for a better estimate of your real estate costs. Leasehold Improvements. Costs vary widely, but generally range between $60,000 and$250,000. This estimate assumes that you will construct tenant finishes having a synthetic stucco exterior finish and commonly accepted quick service restaurant interior finishes, which may include wallpaper, painting, tile and /or wood paneling. The costs for the project will vary based upon local construction costs, local codes and standards, as well as factors such as the availability of a skilled work force, construction financing and other variables. In addition, you will be required to obtain various permits and licenses associated with the development of a new restaurant or for improvements to an existing restaurant. These amounts are reflected in this chart as Miscellaneous Opening Costs. Operating Equipment. The estimate of your investment for operating equipment is based upon equipping a newly constructed facility with specified food preparation and storage, and equipment. These costs will increase if you purchase additional optional equipment for the Restaurant. Furniture, Fixtures and Decor. This estimate is based on a Restaurant with a range of 0 to 50 seats. Your costs may differ depending on the type of facility and the location and seating capacity of your Restaurant. Point of Sale System. You must purchase a Point of Sale System from an approved supplier. The Point of Sale System includes electronic cash registers, kitchen video monitors, receipt printers, and a drive-thru speed of service timing system and headset system if the non-traditional location has a drive-thru. Grand Opening Marketing. Because non-traditional restaurants are generally attached to or located within other structures with a captive audience, the grand opening marketing and initial promotion of the Restaurant will be determined based on the specific circumstances of the location and venue. Miscellaneous Opening Costs. This estimate includes the costs of permits and fees required by local governmental rules and regulations that will be associated with your project development. It also reflects the costs for professional services you may require with architects, engineers, attorneys and/or accountants. Total Estimated Initial Investment. This amount reflects our current estimate of your initial investment for a Taco John’s non-traditional Restaurant. The amounts shown are our best estimates of the amounts that Franchisees may spend for the purposes indicated. However, your actual costs may be higher or lower depending upon your particular circumstances including the size and/or location of the Premises of the Restaurant and whether you lease or purchase the land and/or building for the Premises, construction and labor costs in the area, your discretionary expenditures, and other factors, such as tenant allowances negotiated with the landlord, if any. 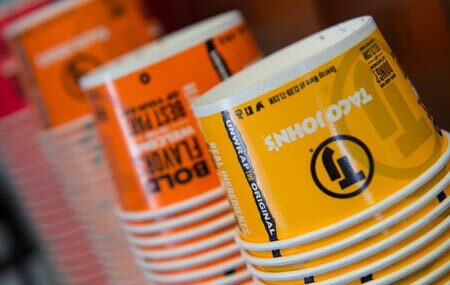 We relied on more than 48 years of experience operating Taco John’s Restaurants to compile these estimates and on the information we have obtained from our current Franchisees. The estimates are averages and reflect expenses for a single Restaurant under typical circumstances. Your situation may not be typical, and unforeseen circumstances may arise. You should review these figures carefully with various business advisors before making a decision to purchase a Taco John’s Restaurant franchise. You should be aware that a variety of factors such as market demand, demographics, the extent to which you follow our methods and procedures, local economic conditions and your own business experience may affect many of the described expenses. We do not offer financing directly or indirectly for any part of the initial investment. The amounts set forth in the above tables are non-refundable. “Point of Sale Totals” means the total receipts of the Restaurants, but does not include sales tax or equivalent taxes. “Service Fees” consists of fees paid to the distribution center, such as delivery charges, fuel surcharges and other fees and expenses. “Costs of Sales” includes food items, paper products and service fees. “Variable Expenses” consists primarily of repair and maintenance, credit card fees and operating expenses. “Controllable Costs” consists primarily of office expense, cash losses, Local Store Marketing expense, laundry and uniforms, employee recruiting, crew incentives, business promotion, telephone, utilities and general manager travel. Our company-owned Restaurants pay Royalty Fees and pay into the Advertising Fund at the same rate as our franchisees pay. Advertising Fund Fees for the company-owned stores shown in this chart are higher than the fees shown in Items 6 and 11 of this Disclosure Document because these company-owned stores participate in an Advertising Cooperative which has voted to pay extra Advertising Funds into the cooperative for local advertising. We have combined the Advertising and Marketing Fee paid to us and the advertising fees paid to the cooperative in one row rather than showing these two fees in their own separate rows. “Occupancy and General and Administrative Costs” consists primarily of rent, depreciation, property taxes, insurance, legal and accounting, administrative allocations, and miscellaneous income and gain or loss on sale of assets. Fill out this form to receive your free Taco John's Franchise Information Report.